The structural relief of the East European plain, shaped by erosion and denudation, is represented by the alternation of lowlands and highlands. The absolute heights are low: the hills of the Valday and the Smolensk-Moscow uplands reach 250-300 m above sea level, while in the Polesye, Meshera, and Vetluga lowlands absolute heights do not exceed 150 m. Mountains occur only on the rims of the plain. Topography is not a major control over distribution of forests in the sense that nothing physically disrupts a gradual transition between the biomes. It is therefore spatial variation in climate that creates a succession of geographical zones. Locally, however, landforms can be an important factor. First and foremost, they control moisture availability through various drainage conditions and, therefore, the character and distribution of plant communities within mixed and deciduous forest biomes. Most of the moisture comes to the region from the west and north-west and there is a gradual decrease in precipitation and soil moisture eastward and south-eastward across the plain. Annual precipitation exceeds evaporation and varies between approximately 700-800 mm in the west (the Baltic States) and 550-600 mm in the east (the Volga region). The western slopes of uplands in Central Russia receive just under 700 mm of precipitation, while in the rainshadow precipitation is reduced. Moscow, located in the north-central sector of the plain, marks the limit of drought conditions. Northward and westward of Moscow, droughts are infrequent. In summer, temperatures are higher in southern regions. Mean temperatures in July vary between 17°C in the north and west and 20°C in the south and south-east. Mean daily temperatures above 10°C are registered for more than 4 months in the mixed forest zone and for 5-6 months in the deciduous forest zone, which indicates an adequate heat supply for the development of deciduous species. Winters are distinguished by permanent snow cover. In winter, temperature gradient is a function of continentality rather than latitude and is directed from the west (mean air temperature in January is about -7°C) to the east (-13°C). Winter causes a complete interruption in the vegetative period. The east-west climatic gradient causes steppes to advance northward as one gets nearer to the Urals and causes a decrease in Central European species, and an increase of those from Southern Siberia. No other region in Northern Eurasia was affected by the Pleistocene glaciations as strongly as its European part. The largest ice sheet advanced as far south as 47°N and flora and fauna became impoverished as a result of repeated glaciations. At present, many genera are lacking from the forest biomes which existed during the Tertiary and partly during the interglacials. Mixed and deciduous forests became re-established in the glaciated areas after the ice sheet retreated (the last ice sheet had left the East European plain by 10 000 years BP). In the postglacial period considerable changes in flora and fauna occurred mainly in response to the climatic amelioration. The Pleistocene glaciations left a cover of glacial, fluvioglacial, and glacio-lacustrine deposits across the plain. The importance of loamy deposits gradually increases southward and loess is typical of the southern areas. Deciduous tree stands usually develop on loamy substrata, while pine and mixed stands occur on sandy and silty substrata. Brown forest soils are typical of the western regions dominated by Fagus. Grey forest soils are typical of the regions with higher continentality of climate. They usually develop under Quercus and Tilia forests. Podzols develop under the mixed forests. 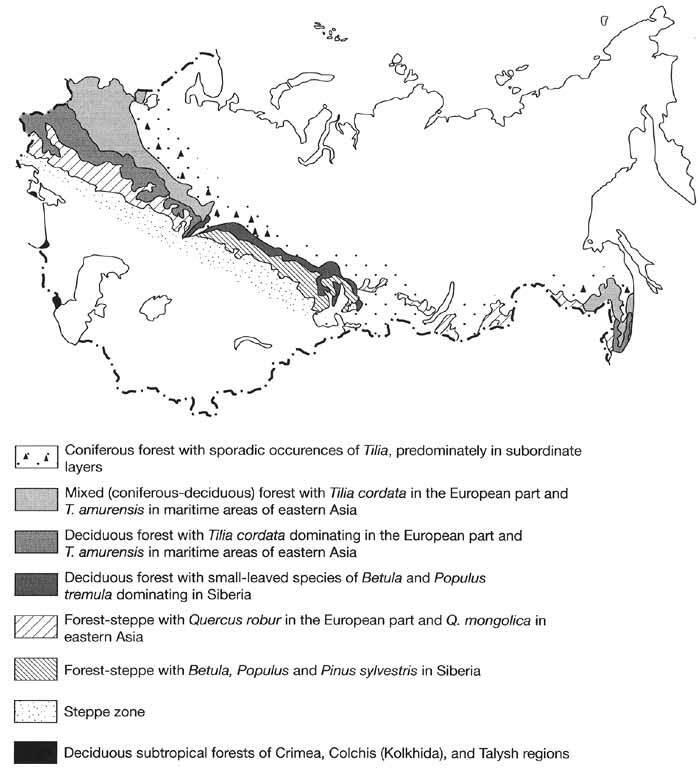 Mixed forests of the East European plain (which are often referred to as subtaiga because they are distributed south of taiga) represent a complex mosaic of dynamic mixtures of coniferous and deciduous tree stands (Agakhanyants, 1986). Pure coniferous or deciduous stands occur locally but very often they are replaced by the secondary small-leaved stands. Among coniferous tree species, Picea abies and P. obovata prevail on loamy substrata and Pinus sylvestris on sandy substrata. Among deciduous species, Fagus sylvestris and Carpinus betulus are typical of the western regions and Quercus robur and Tilia cordata of the centre and the east. The flora of mixed forests is much richer compared to that of taiga. For example, 1115 species grow in the northern regions of Belarus and 1176 occur in the south. The total number of species in this republic reach 1450, while there are about 800 species which widely occur (Kozlovskaya and Parfenov, 1972). The phytomass reserves in mixed forests are on average 250-280 t ha-1, which is marginally higher than in taiga (Bazilevich, 1993). The share of wood in phytomass is high and reaches 70-77 per cent. The annual production of forests is 9-12 t ha-1, but sometimes may attain 18 t ha-1 (Bazilevich, 1993). The annual mass of litter attains 3-5 t ha-1 of which ash elements constitute 200-400 kg ha-1 (Isachenko and Shlyapnikov, 1989). The total reserve of dead phytomass is estimated as 50 t ha-1. Species composition varies strongly between the regions. Forests with dominating conifers (especially Pinus stands) and an insignificant admixture of deciduous species prevail in north-western Russia and the Baltic States. For example, in Estonia mixed forests have the following distribution of main tree species in percentage of total forested area (Valk and Eilart, 1974): Pinus sylvestris, 48 per cent; Picea abies, 20 per cent; Betula ssp., 27 per cent; Populus tremula, 2.1 per cent; Alnus ssp., 2.5 per cent; deciduous species (mostly Quercus robur and Fraxinus excelsior), 0.6 per cent. The share of Quercus-Picea stands gradually increases southwards. In northern Belarus, Picea covers 17 per cent of the forested areas and Quercus 1.5 per cent. In central Belarus, Carpinus-Ouercus-Picea forests appear with the following indices: Picea 8.7 per cent, Quercus 3.3 per cent, and Carpinus 0.3 per cent (Yurkevich et al, 1979). The mixed forests of Belarus have a multitier structure. In the north, the highest tree tier is dominated by Pinus with an admixture of Picea, Betula, and Populus tremula; the second tier is represented by Quercus, Tilia, and Acer. In central Belarus, the highest tree tier is formed by Carpinus betulus, Quercus and Fraxinus, and the lower one by Tilia, Acer, and Vlmus. Under the tree canopy, a dense undergrowth of Corylus avellana often occurs. Tilia was widespread in Belarus until recently. For example, Kaigorodov (1911) described the forests of the Minsk Province as very rich in lime stands. However, it suffered from heavy fellings throughout the 20th century and in particular, between 1936 and 1944, when the area of lime stand was reduced by 47 per cent (Kurnaev, 1968). In Central Russia, typical mixed forests are dominated by Pinus, Picea, and deciduous species. The participation of Quercus robur is notable and traditionally it has been recognized as the main deciduous component (Alekhin, 1947, 1951; Petrov, 1991). However, Kurnaev (1968) found that in primary forests Quercus robur is being widely replaced by the less demanding Tilia cordata which at present represents the main admixture in coniferous stands. Only in well-drained habitats do Picea, Tilia, and Quercus occur in the highest tree tier in equal proportion. The lower tree tier is composed mainly by Sorbus, Ulmus, and Acer, and occasionally by Malus. Lonicera often occurs in shrub tiers. The herbaceous cover is composed mostly by Galeobdolon luteum, Mercurialis perennis, Aegopodium podagraria, and other typical nemoral species.1 Betula-Alnus glutinosa forests with an admixture of Picea develop in wet habitats, forming a common hydrophilous version of mixed forests. North-eastward, in the basin of the river Vetluga (north of the Nizhny Novgorod region), alternating Abies-Picea and Abies-Picea-Tilia stands dominate. The latter are secondary forests which form after the felling of dark conifers. They are characterized by a well-developed herbaceous cover, with Melica nutans, Lathyrus pisiformis, Paris quadrifolia, Oxalis acetosella, and Carex pilosa being the most common species. In the Abies-Picea forests, many nemoral herbaceous plants typical of the Central Russian forests, such as Asarum europaeum, Pulnwnaria obscura, and Gallium odoratum, widely occur. Further east, in the Kama basin, the coenose-forming function changes from Picea abies to P. obovata, locally together with Abies sibirica. The latter penetrates as far south-west as Kazan (55°45'N; 49°10'E) and Cheboksary (56°08'N; 47°12'E). Tilia cordata is the most important deciduous species across the Cis-Urals region. Stands of Tilia cordata occur frequently as far north as the Kostroma and Vyatka regions. Ulmus glabra and Acer platanoides are less common and Quercus robur is suppressed and occurs only as undergrowth. The deciduous forests of the East European plain (Figure 10.1) are distinguished by high biodiversity. The composition of deciduous forests changes notably across the region. In the western regions, Central European deciduous species occur, such as Fagus sylvatica, Carpinus betulus, Quercus petraea, Tilia tomentosa, Castanea saliva, Acer pseudoplatanus, and Cornus mas, sometimes together with coniferous species Abies alba and Pinus cembra. The shrub layer is represented mostly by Corylus avellana and Euonymus europaeus and herbaceous cover by Gallium odoratum, Asarum europaeum, Aegopodium podagraria, Mercurialis perennis, Euphorbia amygdaloides, and Dentaria glandulosa. The occurrence of Central European species decreases gradually from west to east, and participation of Siberian species increases. Carpinis betulus disappears first, and further eastwards Fraxinus excelsior. Productivity of deciduous forests is generally high but varies strongly between the regions. The mean reserves of phytomass are estimated as 325 t ha-1, however, it may be as high as 500 t ha-1 and the share of wood exceeds 80 per cent. The annual production is high, about 12 t ha-1. The reserve of forest litter is only 10 t ha-1 and the reserve of dead phytomass does not exceed 45-60 t ha-1 (i.e., about 15 per cent of the total phytomass) (Bazilevich, 1993), indicating the high energy value of deciduous forests. In the westernmost areas (the Carpathian foothills and lower slopes), Fagus stands with a small admixture of Acer pseudoplatanus, Quercus petraea, and Tilia tomentosa develop. They are characterized by thick litter, shade-enduring plants, and an almost complete absence of undergrowth. The herbaceous cover is represented only by nemoral species. Magnificent deciduous forests have been preserved in southern Belarus (Yurkevich et. al., 1979). Oak forests of a complex structure with Oxalis acetosdla occur on watersheds and slopes with loamy substrata. The highest tree tier is composed by Quercus, Carpinus, Acer, Tilia, Ulmus, and Fraxinus and the lower one by Picea and Carpinus. Corylus, Sorbus and Euonymus dominate in the undergrowth and the herbaceous cover is represented by nemoral species. Depressions are usually occupied by oak forests with Aegopodium podagraria but in wetter habitats Urtica dioica prevails in the herbaceous cover. These forests have multiple tiers: the highest one is composed mainly of Quercus, Acer, and Tilia, the second of Acer, Carpinus, and Ulmus and the third of Malus, Sorbus, and Pyrus. The share of Quercus and Carpinus is higher than average in the regions where intensive economic development of forests began relatively early because both species were less affected by human activities (Kurnaev, 1968). The primary forests probably had a larger share of Tilia, which later suffered from cattle grazing and fibre production. A survey of large trees in the famous Bieloweza Puszcza (a national park and one of the best preserved forests of Europe situated at the border of north-eastern Poland and Belarus), an area where fibre production is widely developed, revealed that Tilia was only slightly less common than Quercus (30 per cent and 35 per cent of all trees, respectively), while young trees, which are used for fibre production, are felled to a greater extent. Tilia stands develop on the well-drained watersheds of southern Belarus and are representative of zonal habitats. A small admixture of Quercus and Fraxinus and, in the second tier, of Carpinus is typical of these forests. The overall degree of deciduousness, which has long been used as an indicator for distinguishing between major forest types, is greatly reduced in the region of Polesye (southern Belarus and north-western Ukraine). Mixed and deciduous forests as well as pure Pinus stands (known as bar in Slavic languages) occur here. Dominating ecosystems are Finns forests intermingling with Sphagnum raised bogs. The widespread occurrence of Pinus stands is related to both sandy substrata and human impact. In rare dry localities deciduous forests develop. Their occurrence reveals the continuity of the deciduous forest biome and, because Pinus forests represent azonal associations, southern Polesye is attributed to the deciduous forest biome. Northern Polesye, where the share of Picea stands is 0.8 per cent and the share of Quercus stands is 8.1 per cent, is attributed to the mixed forest zone (Yurkevich et. al., 1979). Deciduous forests develop in watershed habitats with loamy substrata and more fertile soils, while coniferous and mixed forests occur in depressions with sandy substrata. Apart from the pure Pinus stands, there are also Ouercus-Pinus forests, developing on the weakly podzolic soils and silty substrata (Walter, 1977). Such relics as Salvinia natans, Aldrovanda vesiculosa, and Rhododendron luteum occur in Polesye. The latter one is also found in the Volyn region in western Ukraine. Further south, in the Transdnieper region of the Ukraine, deciduous forests are widespread and dominated by Quercus with admixture of Fraxinus in the highest tier and considerable participation of Tilia and Carpinus in the second tier (Alekhin, 1951; Artyushenko et. al., 1982). This area is characterized by the highest biodiversity within the deciduous forest zone of Northern Eurasia (Lavrenko and Sochava, 1956). Many European tree species (not found further east) including Q. pubescens, Acer pseudoplatanus, Prunus avium, Sorbus torminalis occur there. Carpinus betulus and such shrubs as Rhus cotinus, Cornus mas, and Prunus mahaleb are common in this area. All the above-mentioned species, apart from Carpinus betulus, are not found in Central Russia and only such European shrub species as Euonymus europaeus, Cornus sanguinea, and Sambucus nigra occur. The Central Russian deciduous forests are best preserved in a belt of zaseki, the primary forests which were preserved to serve as a protection from the Mongol invasions during the Middle Ages. The Tula Zaseki (a strip of forests, between 2 km and 5 km wide, near the city of Tula) is the most typical forest with a complicated multitier structure (Alekhin, 1951; Petrov, 1991). Trees have different heights and tiers are not clearly distinguished, although according to Petrov (1991), the first tier is dominated by Quercus and Fraxinus, the second one by Acer platanoides, Ulmus laevis, and Тим cordata, and the third by Acer campestre, Malus, and Pyrus. Tilia cordata prevails in zonal watershed communities (Kurnaev, 1968). In this area, as well as in the Central Russian (Srednerusskaya) upland, Betula and Populus dominate in secondary forests where Quercus is totally absent. Plants in the shrub layer of the forests in Central Russia are often strictly differentiated by height: Corylus avellana attains 5-6 m, while Euonymus is less than 2 m. Unlike in coniferous forests, the low growing shrubs are absent. The herbaceous cover, however, is well developed and consists predominantly of broad-leaved species (Aegopodium podagraria, Carex pilosa, Gakobdolon luteum, Pulmonaria obscura, Galium odoratum, Asarum europaeum, Convallaria majalis, Mercurialis perennis, Viola mirabilis, Paris quadrifolia, and Stdlaria holostea). Almost all these species are perennial and have vegetative reproduction. A distinct height differentiation may be observed in the herbaceous cover with broad-leaved species concentrating mostly in the upper tier. Ephemeroids dominate in the lowest tier. This specific group of perennial plants is represented by about ten species, including Corydalis solida, Anemone ranunculoides, Gagea lutea, Ficaria verna, Scilla siberica, and Dentaria quinquefolia. They flower in spring, well before most trees, forming multicoloured bright carpets. In early summer, their stems and leaves die while the tubers, bulbs, or rhizomes remain preserved in the soil. Green mosses occur only as odd patches and are often completely absent, being suppressed by leaf litter that accumulates at the soil surface. Further east, in the region of the Volga, many European species disappear. For example, while Fraxinus still occurs in the south of the Nizhny Novgorod region, it is not found east of the Volga. On the uplands just west of the Volga, old Tilia stands and impoverished Tilia-Ouercus forests remain locally. As well as Quercus and Tilia, there are also such tree species as Acer platanoides, Ulmus scabra, U. laevis, Malus sylvestris, and among shrubs Euonymus europaeus, Lonicera xylosteum. Siberian species occur among the shrubs, for example, Crataegus sanguinea, Cornus sibirica and in more southern areas Lonicera tatarica. Only in the northernmost areas of the Cis-Volga (Privolzhskaya) upland deciduous forests, developing on the light grey soils, stretch as a more or less uninterrupted belt (Kurnaev, 1968). In these woodlands, the participation of Siberian species is notable. Small stands of Quercus are found in ravines. Due to the increasing continentality of climate, peculiarities of topography and human impact, only isolated stretches of deciduous forests occur in the Transvolga region (Lavrenko and Sochava, 1956). They develop on higher watersheds which receive more precipitation, while in less humid depressions steppe vegetation prevails. Only in the vicinity of the Urals, where orographic uplift of the western air flow supplies enough moisture, does the deciduous forest belt become uninterrupted again and occurs mostly along the lower mountain slopes. The old forests on watersheds of the Transvolga consist predominantly of Tilia, which is less demanding than Quercus and adapts better to the local environment. Old Tilia stands are associated with more podzolized soils on northern slopes, and Quercus stands are associated with more fertile soils of southern slopes (Kurnaev, 1968). The herbaceous cover is mostly represented by the same species (Aegopodium podagraria, Stellaria lanceolata, Galium odoratum, Carex pilosa, Dryopteris filix-mas) as in the Tula Zaseki. There is an intimate link between the forest-forming tree species and soils and slope characteristics. At the extreme east of deciduous forest zone, large stretches of primary Tilia forests with a small admixture of Quercus are still preserved in many areas and single Tilia trees are scattered around arable fields. Numerous vegetated wetlands and peatlands occur widely, particularly in the north-western regions and in Polesye. Both geomorphological and climatic factors contribute to their formation. Precipitation exceeds evaporation across the northern and western sectors of the East European plain and there are many poorly drained depressions in the formerly glaciated regions. Swamping decreases southwards and south-eastwards in response to increasing evaporation and the widespread occurrence of loess. In the mixed forest zone (especially in Polesye, Meshera, and the northern part of the Vologda region), vast areas are occupied by oligo-trophic bogs with Sphagnum mosses, Eriophorum ssp., and shrubs. The share of herbaceous wetlands increases southwards. In the mixed forest zone, swamped forests are common. They are mainly composed of Alnus, Betula, and Pinus. Although composition of the tree tiers closely resembles that of ordinary woodlands, the widespread occurrence of mosses and hydrophilous herbs distinguishes them from zonal forest communities. In such forests, the thickness of the peat layer can reach 1.5-2 m. The formation of swamped forests is related to the expansion of peatlands from topographic depressions on watersheds mainly during the Subatlantic.